I've had this card done for quite some time - just never have gotten around to posting it. When the Tulipe Bigz Die first came out - I just loved the look. 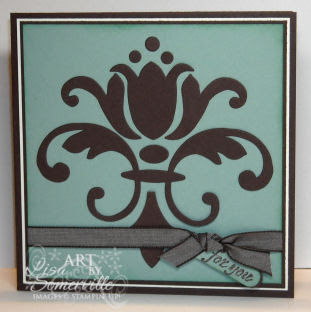 Here, I adhered the punched Chocolate Chip die to my Sage Shadow card stock, tied on some Chocolate Chip Taffeta Ribbon, layered it onto my Vanilla and Chocolate Chip card stock, and added a tag using my Word Window Punch and sentiment from Fresh Cuts. Finished Size - 5-1/4" x 5-1/4". Very nice, Lisa...clean and classic! It's nice to see Sage Shadow, too... Love that color! Gorgeous and love the color combo! I love it, Lisa! I have that die and have hardly used it! Must've been a challenge to get all those pieces back in the right place - any tips?